At least four to five Congress MLAs, including Pandurang Madkaikar, have approached the Bharatiya Janata Party to contest next Assembly election. This was confirmed by Kiran Kandolkar, the party spokesperson and Tivim MLA. He also announced that all 21 MLAs, including ailing Vishnu Wagh, would get party tickets. The media persons asked Kandolkar about Madkaikar since it was rumoured that the Cumbarjua MLA is planning to shift his allegiance from the MGP to the BJP. Madkaikar had recently been speaking openly against the party leadership while also boycotting the party meetings, convened even by central observer Digvijay Singh. In fact he went to the extent of stating that he would quit the party if the same old guards, including five ex-chief ministers, get Congress tickets once again. These old guards included Pratapsing Rane, Luizinho Faleiro, Francisco Sardinha, Ravi Naik, Digambar Kamat, Subhash Shirodkar and Churchill Alemao. Alemao however has already joined the Nationalist Congress Party after confirming that he won’t get Congress ticket. Madkaikar had earlier praised MGP leader Sudin Dhawalikar, stating that he should be the chief minister. But recent reports indicate that he may join the BJP. “They have approached, but party has not decided anything in this regard”, said Kandolkar, after the legislators’ meeting held in the capital city to chalk out election strategy. He also confirmed that all the sitting 21 legislators would be given tickets. 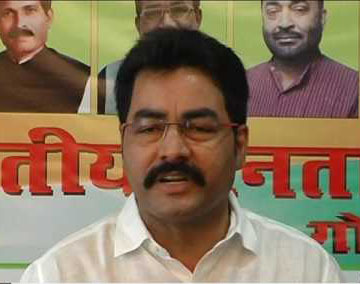 In a way, he has put to end speculations at least about two disputed seats – Shiroda of Minister Mahadev Naik and Sanvordem of Ganesh Gaonkar. The MGP has been demanding Shiroda seat. On the other hand, BJP Goa president Vinay Tendulkar is eyeing Sanvordem, which he had represented once.